In a chaotic world, the Christine Center is a sacred space that can be a balm for the broken, a haven for the weary, a light for the searching, and a place where the fruits of the spirit can grow. The Christine Center is known for its spirit of warmth, high-quality programming, and delicious vegetarian and vegan meals. 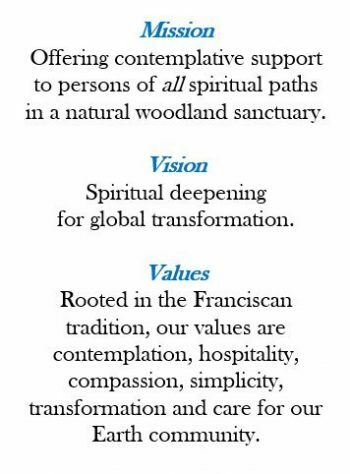 Echoing our Franciscan roots, we cherish the value of contemplation, hospitality, simplicity, transformation and care of our Earth community. We don’t direct your path; we don’t judge your journey. We serve, empower, and celebrate you. We create and nurture an intentionally welcoming and safe environment. We foster a climate of purposeful inclusion. We cherish the diversity of gender, age, race, ethnicity, national origin, range of abilities, sexual or affectational orientation, gender identity and expression, financial means, education, and political perspective. 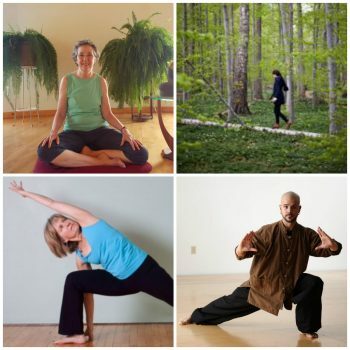 You can choose from our calendar of group retreats or design your own, join our spiritual deepening program, draw on the wisdom of our spiritual guides, join in with meditation or chanting, savor sound healing, express yourself through intuitive painting or mandala-making, enjoy our sauna, relax with massage therapy from a licensed provider, and feel a new closeness to the Earth through our woods and prairies, trails and gardens, abundant wildlife and glorious stars. This is also a unique setting for board meetings, educational sessions, staff retreats, and other events. My prayer, as the executive director, is that I will help nurture the spiritual deepening that has been our hallmark for nearly 40 years. May we—you, the Christine Center, and I–as we go about the mundane tasks of our lives, make every moment sacred by loving abundantly. Coming soon: Online retreats, seminars and experiences here! Check winter road conditions here.